XZC ultrasonic vibration screening machine has changed the current situation of difficult screening in single vibration screening, which can effectively solve the problems of strong adsorption, electrostatic reunion, high fineness, high density, light weight and so on. Compared with the same type of products, it has the advantages of reliable operation and convenient adjustment. The ultrasonic vibration screening machine adopts advanced intelligent vibration ultrasonic controller, which changes the inadaptability and intonability of the single frequency, and realizes the organic combination of ultrasonic wave and vibrating screen. The performance reaches and exceeds the level of the similar products of the world. It adopts integrated circuit board, fully enclosed, digitalized CPU control, aviation special interface, and can work continuously for 12-24 hours without cooling and cooling. 1, in order to achieve high precision and high mesh screening, we control narrow granularity. 2. It can be used in single-layer and multi-storey, and a set of intelligent ultrasonic generator uses three transducers simultaneously. 3, thorough self-cleaning function of sieve mesh: more than 500 mesh screening, no mesh blockage, no screening efficiency attenuation. 4, truly solve strong adsorption, easy to reunite, high static electricity, high density, high density, light weight screening problems. 5. Ensure that the properties of the processed materials are unchanged. 6, the accuracy of screening can be increased by 1 to 70%, and the output can be increased by 0.5-10 times. Special Description: in addition to the same specifications of XZ series screwing screen, there are many special design forms, screening of special materials, and different special designs of XZC series ultrasonic vibrating screen, especially the targeted design of intelligent vibration ultrasonic controller, and the equipment structure of sieving under lazy gas protection. It has been applied: 400 mesh, 500 mesh and 600 mesh sieving silicon carbide, alloy powder, molybdenum powder, stainless steel powder, tungsten powder, nickel powder, cobalt powder, powder coating, quartz powder, butadione powder, malt powder, ribavirin, coffee powder, electromagnetic powder, negative electrode material, laser powder. The basic principle of the ultrasonic vibration screen is that the high-frequency oscillations generated by the oscillator are converted into sinusoidal and longitudinal oscillations by the converter. These fluctuations are transmitted to the pre consumption rod resonator and then uniformly transferred to the screen surface. Transducer: a piezoelectric transducer designed by the piezoelectric effect is a kind of device that transforms the ultrasonic frequency energy into mechanical vibration, and the vibration screen transducer is a kind of classification. It is mainly composed of gland, piezoelectric ceramic, electrode, radiation head, prestress screw and insulation sleeve. 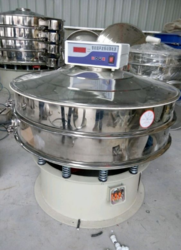 The vibrating screen is superimposed by ultrasonic vibration of the previous mechanical vibration, and the powder is selected more meticulously and evenly. It has good performance, power conversion efficiency up to 95%, strong amplitude, high vibration speed, fast vibration and uniform, can shorten the separation time of fine material, improve work efficiency and quality; heat resistance is good, use temperature range is wide, heat is small, can work continuously. * the new network frame structure effectively protects and prolongs the service life of the screen. The life of the screen is increased by more than 10 times, and the wave energy frequency of the ultrasonic system is transferred to the screen surface. * with continuous mode and pulse mode for different types of material conversion, its unique high frequency band can be more effective to remove miscellaneous and break masses, play the role of clearing the net, prevent the appearance of blocking network, and be the best for the screening of electrostatic, agglomeration and strong adsorptive materials. * the application of the unique ultrasonic system does not need to add any other screen cleaning device. The ultrasonic system can not only be applied to the ultrasonic vibrating screen, but also can be used as the screen cleaning device for the swing screen. * the unique structure of the network structure and completely solve the problem of changing the screen mesh. * no need to add bounce and other anti clogging devices to prolong the service life of the screen. * the ultrasonic system is fully modular and sealed assembly, especially suitable for high dust, high humidity environment, convenient maintenance, and the protection level of the shell can reach IP65.